How to Go Metro to the Special Olympics World Games! A warm welcome to the many athletes, visitors and volunteers in Los Angeles and the surrounding area for the Special Olympics World Games! There are a number of ways to get around our region — transit, private car, taxi and car sharing. We encourage everyone to mix and match to find the best way around. That said, let us repeat: PARKING WILL BE LIMITED FOR THE OPENING CEREMONIES ON SATURDAY NIGHT. The Expo Line, with two stations near the Los Angeles Memorial Coliseum, is a good alternative and Metro is adding extra service. Metro is the largest transit provider for Los Angeles County. Our buses are pained either orange (for local service) or red (for express service). We also run four light rail lines (the Blue, Expo, Gold and Green Lines) and two subway lines (the Red and Purple Lines) and two bus rapid transit lines (the Orange Line and Silver Line). •The Los Angeles Memorial Coliseum, which is a short walk from the Expo Line’s Expo/Vermont or Expo Park/USC Stations. •The venues at the University of Southern California (USC). The Loker Stadium/Cromwell Field and Uytengsu venues can be best reached from the Expo Line’s Expo Park/USC Station. The events at the Galen Center are easiest reached from the Expo Line’s 23rd/Jefferson Station. •The Balboa Sports Complex in the San Fernando Valley near the Metro Orange Line’s Balboa Station. •The venues at the University of California Los Angeles (UCLA) that can be reached by walking or a shuttle bus from Metro Bus Lines 734 or 720. •The Los Angeles Convention Center which is a short walk from the Pico Station shared by the Metro Blue Line and Expo Line. •L.A. Live, which is also a short walk from the Pico Station shared by the Metro Blue Line and Expo Line. •Alamitos Beach, which is a three block walk from the Metro Blue Line’s 1st Street Station. Please click here for more detailed directions to the above venues. Regular fares are $1.75 per trip for adults and children age five and over. Two children aged four and under may travel free with each fare-paying adult on Metro buses and trains. The $1.75 fare includes two hours of free transfers to other Metro buses and trains. The easiest way to pay fares is with a TAP card, a reloadable plastic card similar to a credit card and also used in many other cities. TAP cards can be purchased for $1 from TAP vending machines at all Metro Rail Stations and all Orange Line stations. If going on a round-trip to a venue, load your TAP card with a $3.50 round-trip fare at the start of your journey — this will help you avoid waiting in line on your return trip. You can also purchase a TAP card loaded with a $7 Day Pass on board all Metro buses. A rider can use a day pass for unlimited travel on Metro buses and trains for that day. If you plan on using Metro daily or very frequently during your visit, a $25 week pass is also available. You can also pay fares on Metro buses with exact change although free transfers are only available to those who use TAP cards. •Metro Rail runs from about 4 a.m. daily until about midnight except on Friday and Saturday nights when trains run until 2 a.m.
•If attending one of the events at UCLA, it’s about a three-quarter mile to one mile walk from the Metro Rapid Bus 720 stop at Wilshire/Westwood to the different venues on campus. •If you want to visit the heart of Hollywood (a popular attraction), take the Red Line to the Hollywood/Highland Station and turn right at street level for the short walk to the TCL Chinese Theater and the El Capitan Theater. The Hollywood/Highland complex sits on top of the station and is hard to miss! 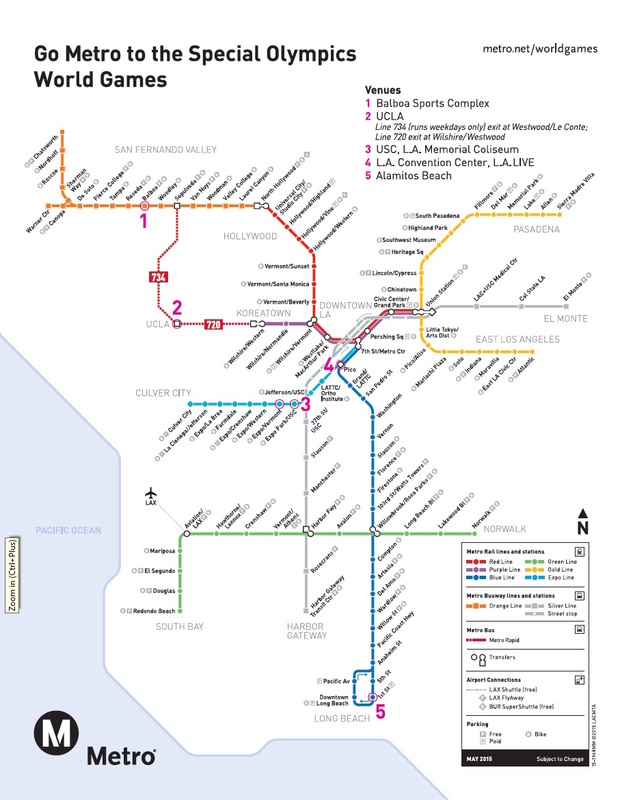 Universal Studios and Universal City can be reached from the Red Line’s Universal City/Studio City Station. After exiting the station, cross Lankershim Boulevard and take the covered escalators up the hill to Universal. •Please follow us on Twitter for tips, service alerts and to ask questions. •You can get real-time bus and train arrival on your smartphone at http://www.nextbus.com. Our Go Metro app for iPhones is available at the iTunes Store and for Android phones at the Google Play store. •All Metro bus and rail timetables are here. Video: Expo test train in downtown SaMo!